Disney has released the new trailer for their live-action remake of Dumbo. Earlier today, the studio released the latest colorful poster for the highly anticipated remake and let fans know that the trailer was going to debut during tonight's Country Music Association Awards. The first trailer for Tim Burton's take on the Dumbo story was released back in June and it unveiled the awesome-looking elephant for the first time as he prepared for flight. Now, we've been treated to a new look at the remake ahead of the March 29th, 2019 release date. The latest Dumbo trailer looks like a Tim Burton project, but it still keeps a Disney feel to it, much like the first trailer. Bright colors that were shown off in the poster release from today are shown again, juxtaposed with the darker elements that Burton is known for. Dumbo looks like it will have plenty of Burton and Disney fans waiting in line to see the movie on opening night. As with any trailer, we're left with a lot more questions than answers, and it's enough to leave us all wanting more. The official synopsis for the live-action Dumbo remake reveals that it is going to be quite different from the original 1941 animated classic. 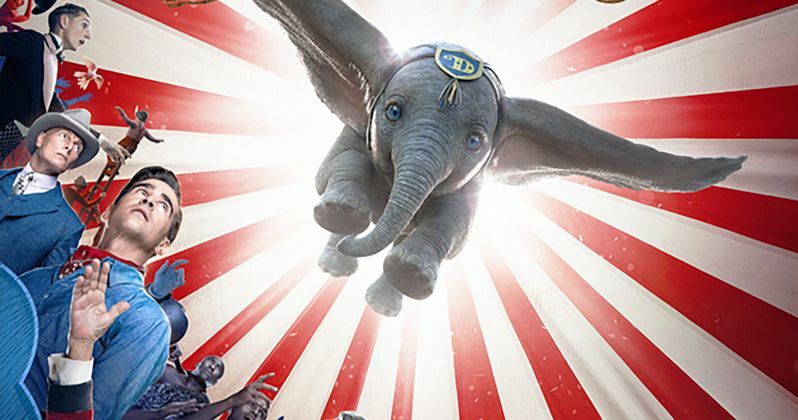 It looks like the baby elephant with the giant ears will be flying towards the beginning of the movie, as opposed to waiting until near the end of the movie to prove others wrong. Tim Burton's version of story will show what happens to the elephant and the circus after his abilities become famous. Dumbo will be criticized for his big ears, much like the original movie, which is something that they couldn't leave out. Disney first announced the live-action remake of Dumbo back in the summer of 2014. It wasn't until early 2015 that it was revealed that Tim Burton had signed on to direct the remake. The project was in development for three years before filming started in the summer of 2017, which lasted until November 2017. Burton and crew have been in the post-production phase since then, taking the time to make the visual effects look the best that they can. Taking Dumbo and trying to bring him into the real-world more than likely took a lot of time and effort to come up with a design that was both realistic and adorable. As evidenced by the latesttrailer, it looks like they succeeded. Dumbo is directed by Tim Burton from a screenplay by Ehren Kruger. The movie stars Colin Farrell, Michael Keaton, Danny DeVito, Eva Green, Alan Arkin, Finley Hobbins, and, Nico Parker. The story is based on a storyline written by Helen Aberson and is loosely inspired by Walt Disney's 1941 animated feature. As with the rest of Disney's live-action reboots, Dumbo looks like it will be a huge hit as well. You can watch the latest trailer for the movie below, thanks to Walt Disney Pictures.